When iOS 6 was released last week, it drew intense criticism for its terrible Maps app. For the first time, Apple (with the help of TomTom) was using its own mapping service, and it was bad. Nevertheless, it didn’t deter eager customers who duly pre-ordered the stocks out of the iPhone 5 (over 2 million in 24 hours, to be exact). In the opening weekend after the iPhone 5 was launched, Apple announced that it sold a further five million units of the iPhone 5, making it the most successful iPhone launch ever. However, according to market analysts, it underperformed by at least a million units, with them predicting at least six to eight million units to be sold in its opening weekend. Regardless, seven million units is a massive achievement for Apple. Unfortunately, this first batch of iPhones seem to be plagued with several chronic hardware issues. While some have complained of “static lines” appearing on the on-screen keyboard, the biggest issue stems from the anodized aluminium body of the iPhone itself. The issue is so widespread, people are complaining about it almost everywhere on the internet, from web forums to Apple’s customer support message boards. 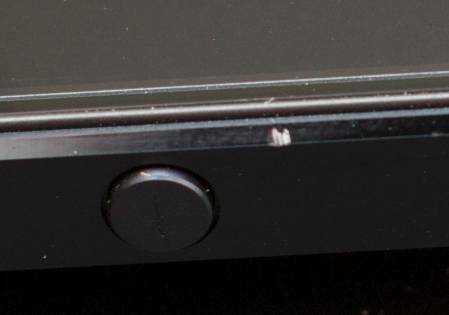 Many have even mentioned that these scratches, scuffs and bumps were present right out of the box, implying that there were some poor quality control down at Foxconn’s manufacturing facility. 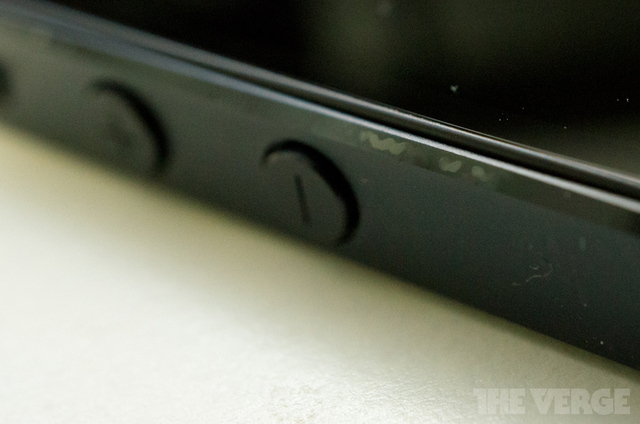 Worse, the black and slate colourway of the iPhone 5 makes it painfully easy to leave a very obvious reminder that aluminium is soft and susceptible to scratches. Also, unlike plastic materials such as polycarbonate, aluminium cannot be painted through, so once the outer paint is scratched the shiny silver material will be visible. 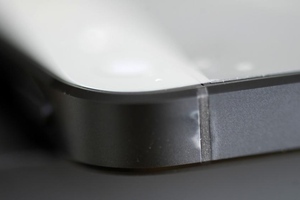 This is particularly annoying to the owners of the iPhone 5, especially since Apple went to great lengths to explain how the iPhone was constructed “with a level of precision you’d expect from a finely crafted watch – not a smartphone.” In fact, the whole point of the shiny borders was to showcase the precision levels that come in the construction of the iPhone, not to serve as a constant annoyance that your new expensive smartphone scratches easier than, well, a lot of things. One would think that in light of this heavy criticism, someone from Apple would come out with their hands up and offer a “we’re sorry that the iPhone 5’s durability is below the standards expected of an Apple device”. Quite the contrary, actually. 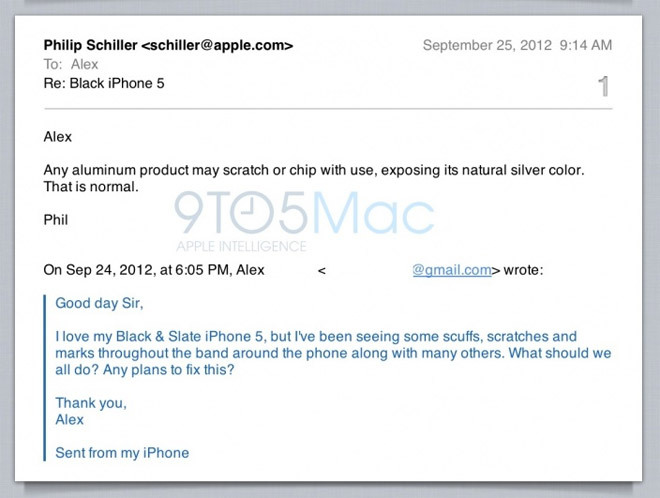 While there has been no official statements regarding the issue, someone sent an email to Apple’s Vice President Phil Schiller (who, during the launch event, lauded the iPhone 5 as “the thinnest smartphone in the world) to complain about the susceptibility of the iPhone 5 to scuffs and scratches – and received a less than warm reply. In fact, it was perhaps a very polite way of telling the sender (and the millions of other iPhone 5 owners) that “hey, that’s your problem, not ours”. It stretches belief that after Nokia’s recent PR disaster and subsequent apology, another company could, and did, outdo Nokia’s misstep. It’s a big pity, because the iPhone 5 does have some interesting aspects that they never disclosed (more on this in our next post).